Britain's high streets are in crisis with retailers fighting a "perfect storm" of pressures including a squeeze on incomes, a shift to online shopping and rising overheads. Prezzo, New Look and Carpetright are among the latest big names set to close stores to cut costs in the battle for survival. As more closures are expected in 2018, those looking after embattled towns such as Nuneaton, in north Warwickshire, are having to be more inventive. The former mining town, whose famous offspring include author George Eliot and filmmaker Ken Loach, has its own story to tell. The fortunes of Nuneaton's high street is reflected in towns and cities throughout England. Traders say the loss of its Marks & Spencer in 2011 followed by the Co-op five years later was a massive blow to trade. The surge in online shopping has also been keenly felt. The town's former Mothercare is now a charity shop, while, like everywhere, Nuneaton also lost BHS and Woolworths. Racheal Matthews, who managed Mexican café Hot Stuff until it shut down in January nine months after opening, believes Nuneaton is losing its heart. "We have got a lot of charity shops and 99p discount shops as well as bookies," said the single parent, who has three children. "There isn't enough to bring people into the town centre - they are going to Coventry, Birmingham and Leicester." Ms Matthews said the market town had "a lot of lovely people" but its centre had declined in the 30 years since she moved there aged 17. "There were lots of shops and the market used to be buzzing," she said. Ms Matthews got the job after being made redundant from a bakery and said there was fierce competition for shop work. "I went into the town centre every single day asking for work - for about five or six weeks," she said. Residents seemed to like the cafe. "Great food. Smashing staff. Just had a vegetable burrito for elevenses and it was amazing," said one of many positive reviews on social media. But Ms Matthews believes it did not survive because the centre was "overrun" with food outlets. Image caption Lisa Burke, co-owner of Hannah's cafe, said it was "doing OK" but the town "was nothing like it used to be". Hot Stuff's former premises is among empty shops dotted on Harefield Road, leading into the town. Nuneaton and Bedworth Borough Council said these three-storey units could be difficult to fill as rents were higher. Along the same stretch is the Mary Ann Evans Hospice shop, one of eight in the county supporting the local charity. Scanning its well-presented clothes, manager Kerry Pegg said: "We do really well. People do use them and it's better than having an empty shop." She would like to see more stores offering something "a little bit different", such as vintage shops. Image caption Bob Sidhu said seeing the market shrink had been "heartbreaking"
Amanda Marston, who has run the Spicy Spud food van since taking it on from her mother-in-law 16 years ago, said it was getting harder to make a living, but she was managing. The council said the number of empty units in the town was about average, while council-owned premises were 97% full. It pointed to busier areas of town, including the Ropewalk Shopping Centre where a Pure Gym and TJ Hughes recently opened. Jonathan White, head of town centres and marketing, said Nuneaton "really has a lot going for it", including ample car parking, a good retail mix, a nice atmosphere and green spaces. He said Nuneaton had seen a reduction in the number of retail outlets and market stalls over the past 20 years but had "weathered the storm better than most". The Labour-run council, which will see half of its members up for election on 3 May, has told residents it is set to announce details of its £7.5m Transforming Nuneaton plans. Proposals include more homes, leisure facilities and making better use of the River Anker and the area around it. 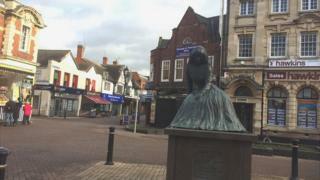 The scheme, funded from the government's Local Growth Fund, will boost the town's "vibrancy and prosperity," it says. Conservative-run Warwickshire County Council hopes the regeneration project will "reduce the north-south divide" between the borough and richer areas such as Stratford-upon-Avon and Warwick. It said the borough, which has been working to attract new business and investors, was starting to see improvements in its economy. The borough council has also been working to bring people into the town with events such as a food and music festival and family activities in the summer. Mr White said town centres were no longer about just retail - visitors expected an "experience" including more leisure elements. "We have to be a bit inventive about what we do and sometimes challenge convention," he said. The market, which has been a feature of Nuneaton since the 13th Century, has also seen a reduction in trade and stalls as footfall has dipped. Chairman of Nuneaton's market traders Bob Sidhu, who runs a clothes stall, said the decline was "heartbreaking". "We will make a loss today and everybody is struggling," he said. He said the number of traders had "about halved" since the market relaunched in 2006, adding it now attracted about 75 on a Wednesday and 100 on Saturdays. However, other stall-holders said the market was still doing well compared to others. Andy Lycett, from Hednesford, Staffordshire, runs a stall with his wife Sharon which is filled with greeting cards, ornaments and decorations. He said a few days a week at markets ensured the couple were still "making a living". Mr White said part of the battle was changing people's preconceptions. "There has to be an acceptance that high streets are changing and what people wanted from their high streets 10 or 20 years ago is different from what they want now," he said. "If people have got out of the habit of using their town centre, it is about encouraging them back in and ensuring that the experience they have is a good one."